You want to transform your body in just 50 days for that high school reunion, big wedding or meet-up with your ex. With appropriate diet and exercise, expect notable weight loss, improved muscle tone and enhanced stamina in these seven weeks. Your exact results depend on your starting weight and fitness level, as well as the time you have to commit to this weight-loss plan. You might not reach your final goal within 50 days, but you can make serious progress and use it to jump-start lifelong results. Quick weight-loss schemes may be tempting as they promise results in a short time. These plans, however, are highly restrictive, so you might have trouble adhering to them and may give up long before your 50-day deadline. Extreme calorie restriction or banning entire food groups can leave you calorie deficient. Even if you manage to stay with the plan and lose weight, as soon as the 50 days are up, and you return to your regular eating habits -- you're likely to regain any pounds you've lost. Aim to maintain a 500- to 1,000-calorie-per-day deficit to lose 1 to 2 pounds per week for the most manageable and sustainable results. You may lose a few extra pounds in the first couple of weeks of the plan as your body adjusts, but expect to lose, at most, about 14 pounds in the 50 days. Create the deficit by combining exercise and making wise food choices. Exactly how many calories you need daily to lose weight over the 50 days depends on how many calories you need to maintain your weight. Your calorie needs are based on your age, size and gender. Use an online calculator to help you pinpoint yours most precisely. A diet of 1,200 to 1,800 calories is considered low-calorie and effective for weight loss for women and men, respectively, but don't go below these calorie levels, or you'll slow your metabolism. Dietary approaches help you lose weight expediently. To stick to your low-calorie goal, avoid foods with excess sugar, refined grains and saturated fat. Also, ditch beverages with calories, such as soda, fruit punch and energy drinks; they're mostly sugar and don't contribute to nutrition. Instead, focus on whole foods that provide a lot of nutrients to keep you energized and feeling full. Fresh vegetables, whole grains and fruit provide fiber, which slows the movement of food through your digestive tract and minimizes blood sugar swings, which often lead to cravings. Protein takes longer to digest than carbohydrates, so you feel more satisfied after eating it. Your body uses more energy to digest protein, too, so you get a minor boost to your metabolism. Adequate protein also supports efforts at the gym to build muscle, which provides further metabolic benefits. Over your 50-day program, make your meal plan simple by including a serving of lean protein, 1/2 to 1 cup of whole grains and generous servings of fibrous vegetables or fresh fruit at each meal. For example, breakfast could consist of two eggs cooked with spinach and mushrooms alongside a whole-wheat English muffin; a smoothie made with cherries, a handful of spinach and Greek yogurt; or oatmeal with blueberries and cottage cheese. For lunch, wrap lean steak in corn tortillas and serve with a few slices of avocado, lettuce and salsa; eat a large salad with romaine, peppers, radishes, carrots and cucumbers topped with grilled chicken breast and olive oil dressing; or have water-packed tuna mixed with low-fat plain yogurt, chopped celery and lemon juice on a whole-wheat pita with carrot sticks on the side. Dinner could be 3 to 5 ounces of any roasted, grilled or broiled protein -- such as salmon, tofu or turkey -- with brown rice or quinoa and two cups of steamed vegetables, such as broccoli, cauliflower, cabbage, zucchini or green beans. Snacks should also consist of whole foods, with an emphasis on protein. For example, have a piece of fresh fruit with a few tablespoons of nuts, yogurt with berries, 1/4 cup of hummus with cut-up vegetables, or woven wheat crackers with low-fat cheese. Scale your portions up or down so that these choices fit into your daily calorie budget. A mix of cardiovascular exercise and resistance training helps you get in shape in 50 days. Cardiovascular exercise moves the large muscle groups to raise your heart rate, break a sweat and burn calories. Resistance training involves using free weights, machines, tubing, your body weight or kettlebells to overload your muscles so that they become stronger and more toned. Having a higher percentage of muscle mass as compared to fat mass also maximizes your metabolism to help you drop pounds. In addition to formal exercise, use the 50 days to raise your all-day level of physical activity. Small non-exercise movement also boosts your calorie burn and your level of health. As noted in a 2010 issue of Exercise and Sport Sciences Reviews, sitting too much -- even if you meet physical activity recommendations -- raises your risk of metabolic disorders and premature death. If you have a desk job, get up and walk for five to 10 minutes every hour, opt for the stairs instead of the elevator, fidget, park farther out in the lot and embrace household chores as an opportunity to help you lose pounds. If you're brand new to exercise, or coming back after a long hiatus, it might take you the first 14 days of your plan to get into a groove. Work up to at least 30 minutes per day most days of the week. At first, focus on moderate-intensity efforts, such as brisk walking, dance fitness classes, water aerobics or light cycling. As you become stronger, increase the duration to 60 or 90 minutes most days as well as the intensity of your sessions to jogging or faster cycling, for example. 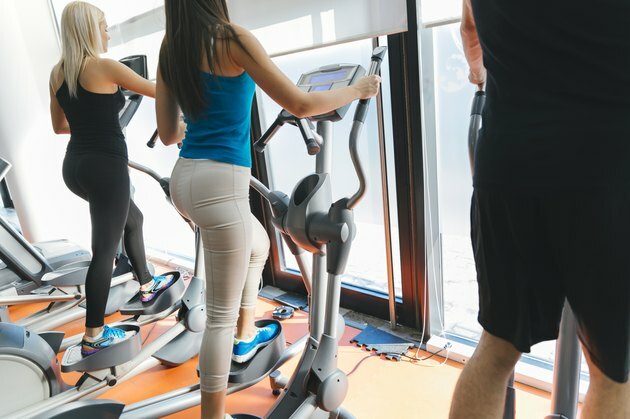 The American College of Sports Medicine declares that at least 250 minutes of moderate-intensity cardiovascular exercise is necessary for significant weight loss. Once you can manage at least the 250 minutes per week, kick up the intensity of some of your sessions to include high-intensity interval training. HIIT -- high-intensity interval training -- spurs your body to more effectively burn fat and can induce greater fitness, reported a paper published in the Journal of Obesity in 2011. This involves alternating short bursts of all-out effort with bouts of low-intensity work. For example, you could do 12 repeats of one minute of sprinting on the treadmill followed by one minute of walking. Do such interval training at two to four workouts per week, but keep some steady-state activity on the other days to promote calorie burning. Too much interval training burns you out and has diminishing returns. Strength training helps offset the natural loss of muscle mass that occurs as you age. This loss of muscle mass makes you feel out of shape and can result in fat gain as your metabolism slows as a result. You don't have to work like a bodybuilder to achieve results. Aim for a minimum of two workouts per week that address every major muscle group, including the chest, back, arms, shoulders, abs, legs and hips. When you first start out, do body weight exercises for just one set of eight to 12 repetitions. Squats, lunges, pushups, pullups, triceps dips and crunches are examples of such moves. After a week or two, add weight, additional exercise and more sets. Use weight that feels heavy by the last repetition in your set of eight to 12 and increase weight as 12 repetitions becomes easy. When you first start strength training, expect notable improvements in your muscle tone and strength. This may taper off as you close in on your 50-day goal, but this is natural as changes become less obvious as you get stronger and fitter. At least once during the 50 days, change up your program by increasing weight, reordering the exercises or adding new moves altogether. Deadlifts, step ups, chest presses, bicycle crunches and single leg squats are more challenging exercises to add in. These changes will help prevent you from reaching a plateau that stalls your progress altogether. Always give yourself at least 48 hours between workouts for specific muscle groups to allow for repair and recovery, which encourages growth. Can You Gain Weight in Two Days?